Simple infections can become serious sight-threatening conditions. 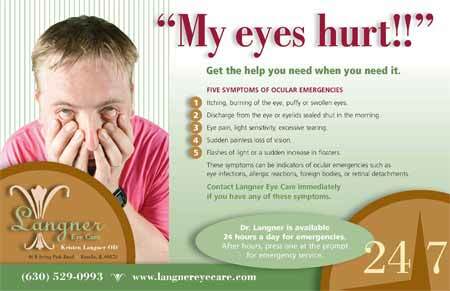 Dr. Langner’s expertise in treating ocular emergencies will ensure protection of your valuable sight. Call 630-529-0993 at any time for help. For after hours emergency service, call (630) 529-0993 and press one to contact Dr. Langner.